Taps is a haunting bugle call that is played at military funerals. During the American Civil War, three slow drum beats were struck at the end of the Tattoo to extinguish the lights. A military Tattoo was originally a form of military music. Today it has evolved to shows involving theatrics and musical performances. The most well-known examples of these being The Royal Edinburgh Military Tattoo and Quebec City Military Tattoo. The tune we know today is a variation on a tune known as Scott Tattoo and popular from 1835-1860. The piece was first used in 1862 as a signal for lights out. Within months both the Confederate and Union armies used the melody known as Taps. Captain John C. Tidball, West Point Class of 1848, started the custom of playing “Taps” at military funerals. In early July 1862 at Harrison’s Landing, a corporal of Tidball’s Battery A, 2nd Artillery, died. 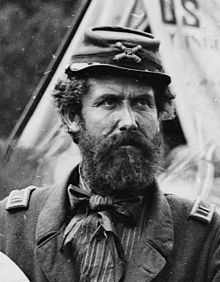 He was, Tidball recalled later, “a most excellent man”. Tidball wished to bury him with full military honors, but, for military reasons, he was refused permission to fire three guns over the grave. The U.S. Army officially recognized the tune in 1874. In 1891, the song became a standard component at U. S. military funerals. The 24 note melody, known as Taps, is played each year when the wreath is laid on the tomb of the unknown soldier in the Memorial Day ceremony. Veterans, school groups, the Girl Scouts and Boy Scouts are all known to use the tune at times. Other titles for the song include Butterfield’s Lullaby and Day is Done.